That's where we come in. We surfed, clicked, and installed to find sparkling free gems capable of planning your time, keeping you in touch, and tuning and securing your PC, not to mention glitzing up your desktop, helping you stay productive, and entertaining you with music, videos, photos, and games. We paid special attention to programs and services you may not have heard of before. We also singled out two free offerings--one download and one online service--as the best of the bunch. 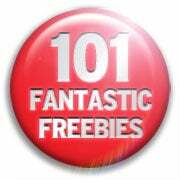 We want to hear your picks for the best freebies, too, whether they appear in this article or not. Please let us know by joining our forum discussion.